My narration of Neal Barrett’s THE HEREAFTER GANG — a classic novel! 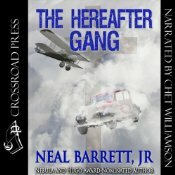 I’d never read Neal Barrett Jr.’s The Hereafter Gang, but had read a lot of Neal’s other work, so didn’t have to think twice when asked to narrate the audiobook. Neal Barrett is a classic writer, one of the finest of our age…The Hereafter Gang is a comic and picaresque novel — a fantasy, a huge Rabelaisian romp, a thing of beauty and a joy forever. To tell anything about this wild and wonderful ride would be to give too much away. The unabridged 11 hours + is available at Audible.com. Get a membership and start downloading now to listen to on your ereader, smart phone, or other fancypants contraption!